Make sure you use the Desert Woodturning Roundup Group Code: DWTDWTA. If you fail to remember to use this group code, your rate will be approximately double. 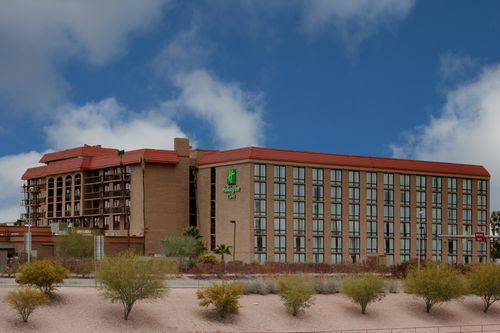 If you have any problems getting the special rate please contact Ana Lappegard at 480-620-5185. Tell them you'd like the Desert Woodturning Roundup group rate. The front entrance to the hotel is less than 100 feet from Mesa Convention Center. The rooms were remodeled in 2004. There is a refrigerator, high speed internet connection, and coffee maker in each room. The hotel is 12 stories with just over 200 rooms. The hotel has a pool, exercise room, business center and laundry for guests. Make sure you use the Desert Woodturning Roundup Group Code: 101650. If you fail to remember to use this group code, your rate will be considerably higher. Tell them you'd like the Desert Woodturning Roundup group rate, and give them the code 101650. Make sure you use the Desert Woodturning Roundup Group Code: DWR. If you fail to remember to use this group code, your rate will be considerably higher. You can also use their central reservations system by calling 1-888-280-5056 and requesting the Desert Woodturning Roundup or using the block code "DWR". 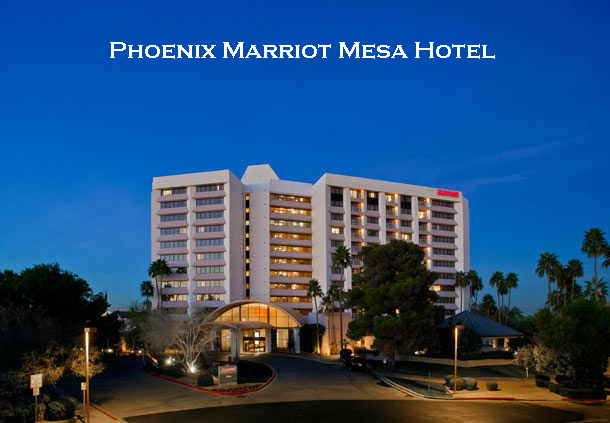 The Marriott does not have shuttle service to or from Sky Harbor Airport. Super Shuttle is recommended. Should you need a rental car while you are here, Enterprise will deliver to the hotel. This is a financial advantage, because car rental fees at Sky Harbor Airport are much more, due to city and airport taxes on rental cars. 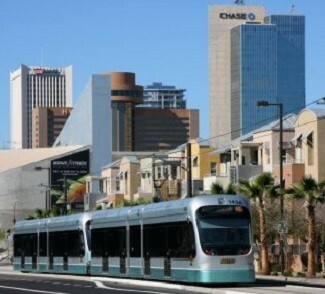 The Phoenix METRO Light Rail system serves Phoenix, Tempe, and Mesa, and has 23 miles of rail. 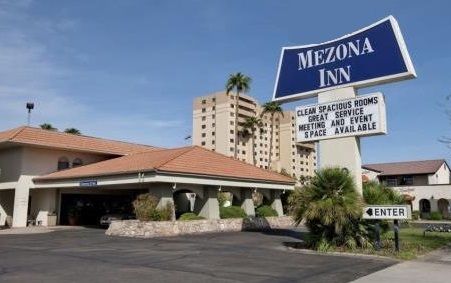 It serves Phoenix Skyharbor Airport, and has a station near the Mesa Marriott and Mezona Inn. If you wish to travel further, it is an integral part of the Metro Transit System. 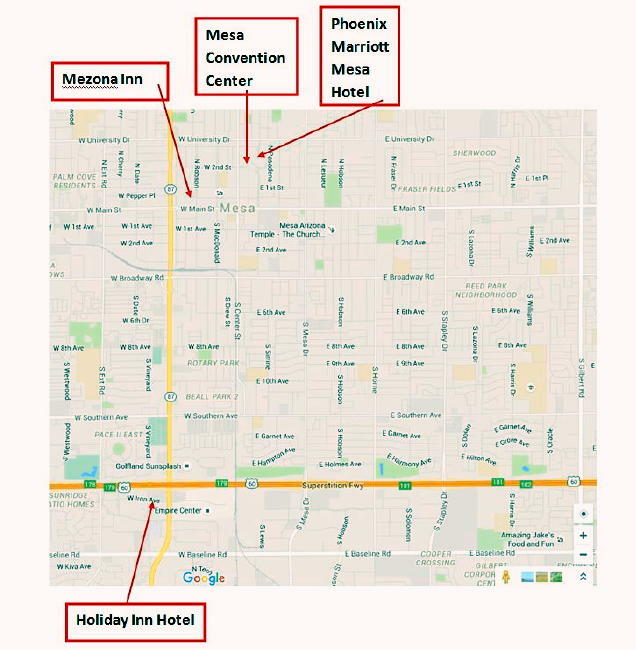 Even if you don't choose to use the Light Rail to get to and from the Airport, you might enjoy a cheap excursion on it through the greater Phoenix metro area. Downloadable map of the Metro Transit System. The Center maintains 500 on-site parking spaces. These spaces are filled on a first come, first serve basis. RVs (motorhome vehicles, fifth wheel and travel trailers, campers) and all other over-sized vehicles may use only the Third Place parking lot. Permits for RV overnight parking can be purchased for $10.00 per event. There are no hook ups. Please register at Building A. For more information call Heather Murray at 480-644-4906.